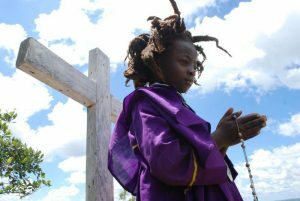 AN AFRICAN SECT teaches that the Third Secret of Fatima revealed that Christ returned to Earth in 1962 in the form of Simeo Ondeto, founder of the Legio Maria (Legion of Mary) and a member of the Luo tribe of western Kenya. The sect, which has been expelled from the Roman Catholic Church, now claims 4.3 million members, mainly in Kenya and Sudan. Also: The Runaways is the latest propaganda from the old gods; Church of Sweden directs clergy to avoid exclusively masculine pronouns for God; DARPA researches AI-controlled brain implants; Israel bombs Iranian military site in Syria; and why we celebrate the birth of Christ on December 25. Click here to get all of the Gilberts’ audio from PID Radio, the Gilbert House Fellowship, and Derek’s interview program A View from the Bunker. P.I.D. Radio 11/24/17: Manson, Serial Killers, and Psycho A.I.